Stroke a soft tummy! Tug a tufty ear! Rub a woolly paw! Touching and handling these cute bears will teach toddlers all about textures. 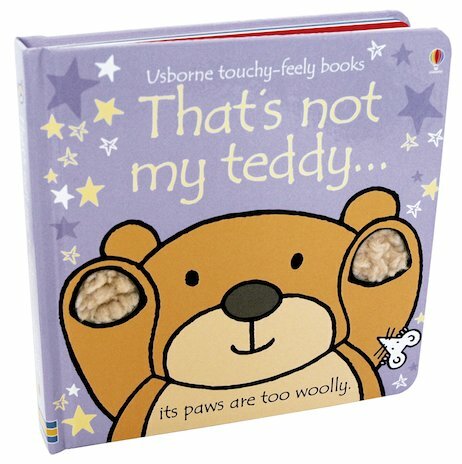 This lovely board book from the popular Usborne Touchy-Feely series encourages children to try out simple words and see how their meanings match real objects in the world. The texture patches provide hours of fun, and are great for developing hand-eye coordination. Great book from the touchy feely collection, this is one of my babies favourites and loves feeling the different textures. Thats not my teddy is a nice book with lots of colourful pages and words and i love reading it and rubbing my hands on the touchy feely pages.I have read quite a lot of the selection of touchy feely books by the author including thats not my dolly and thats not my dinosaur i have enjoyed reading these books and i hope you will like them too!! !